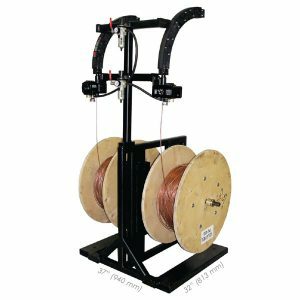 Wire Wizard® Single and Tandem Vertical Dereelers are built to deliver large diameter wire from 1/16” (1.6mm) to 3/16” (4.8mm) on up to 30” (762mm) wood reels. Wire may be dispensed from either the top or the bottom of the dereeler. The tandem model offers dispensing of two wood reels with a small footprint, saving valuable floor space. Optional Wire Pilot® Feed Assists shown in photo sold separately (recommended for large SAW wire).